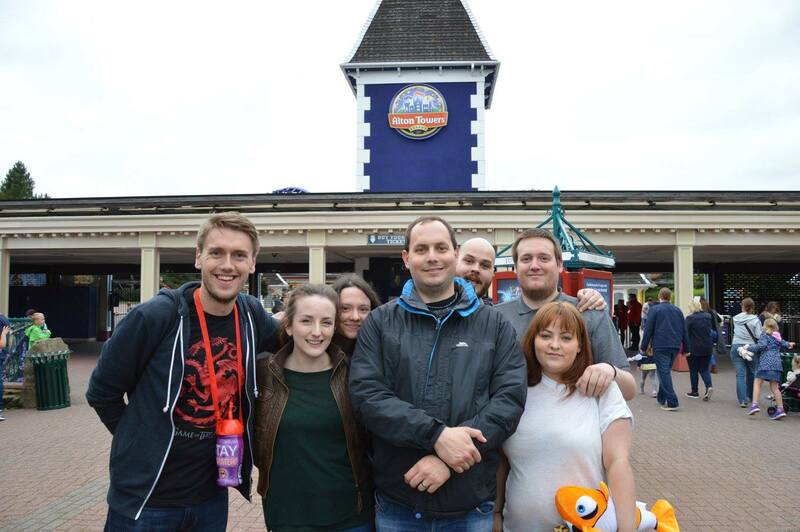 I last posted about Alton Towers on here nearly four years ago, when I wrote about what I described as “the annual Beyond Alton Towers trip”. Since then it hasn’t really lived up to the “annual” bit; we’ve only just finally made it back there. Everyone’s schedule and finances seem to have got increasingly complicated over the past few years and it’s been hard to get the whole group together for things like this. But Alex’s pending 30th birthday finally gave us the hearty kick-up-the-arse we so badly needed, and we managed to not only reunite the core Alton Towers crew (me, Alex, Gavin and Heather) but also drag along Laura, Lori, Stuart and Sam for the ride(s) as well. (The thought of my quite-a-bit younger brother being 30 years old is something I’m still not entirely comfortable with. I’d only just started to get used to the idea of being in my 30s myself, for god’s sake, then Laura went and turned 30 a few months ago, and now Alex is doing it too. Will this ever end??). 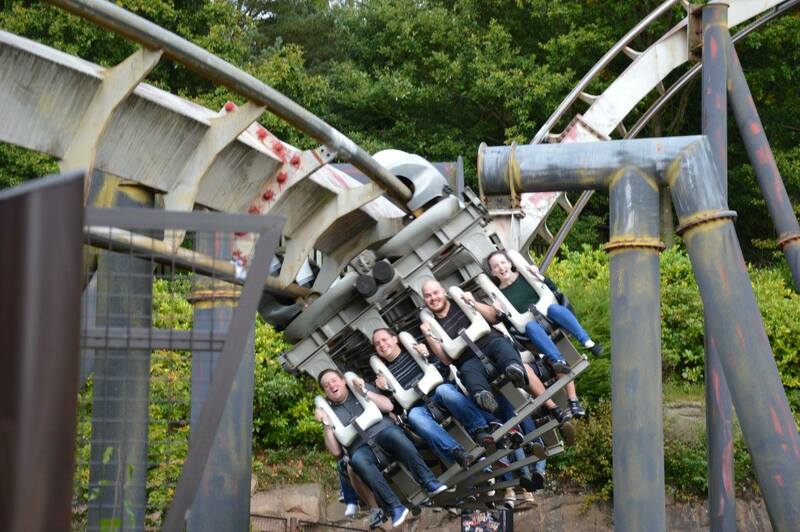 Of course, Alton Towers has been in the news quite a lot this year, following the now-infamous Smiler roller coaster crash back in June that seriously injured four people. Probably mostly because of this, the park was by far the quietest I’ve ever seen it. Most of the time there was virtually no queue for the majority of the rides (Spinball, Rita and Th13teen still had queues but much shorter than normal). It was weird being able to just walk into the Nemesis loading station and get straight on the next train without having to wait at all. Consequently, we managed to do fourteen rides on the first day, most of them big ones, something that would have been impossible on any of my previous visits. No wonder we were all exhausted by the evening after all those adrenaline rushes. The Smiler itself is still closed, and I wouldn’t be surprised if it never re-opens after all that bad publicity. We saw them sending test trains around it, with weights in them to simulate riders. Unfortunately the only other new ride to be added since our last visit (Nemesis Sub Terra) was also closed the whole time, though I’m not sure why. So the only thing that was actually new to me was Enterprise, a big spinny wheel thing near Oblivion. It’s one of the oldest rides in the park, but I’ve never been on it before as Alex always said it wasn’t that good and I’d decided I’d rather spend my precious Alton Towers time queueing for things that were good rather than something that wasn’t. 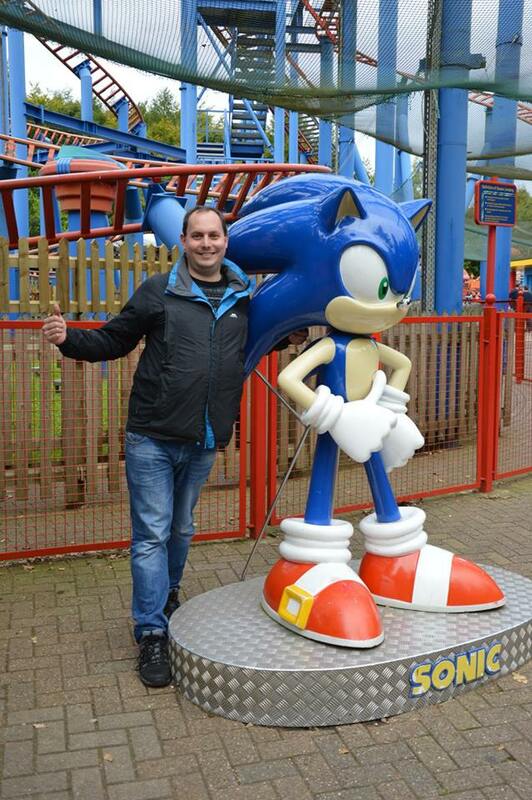 But this time, with hardly any queues to contend with, I gave it a try. It wasn’t bad. It didn’t make me feel as sick as I’d expected it to. Once it got going it felt a bit like going round the same roller coaster loop again and again, only less safe because inside your little cage there’s no lap bar or anything to make you feel secure. Anyway. I may not have done much new stuff this time, but I thoroughly enjoyed revisiting all the old rides again, especially after such a long break. 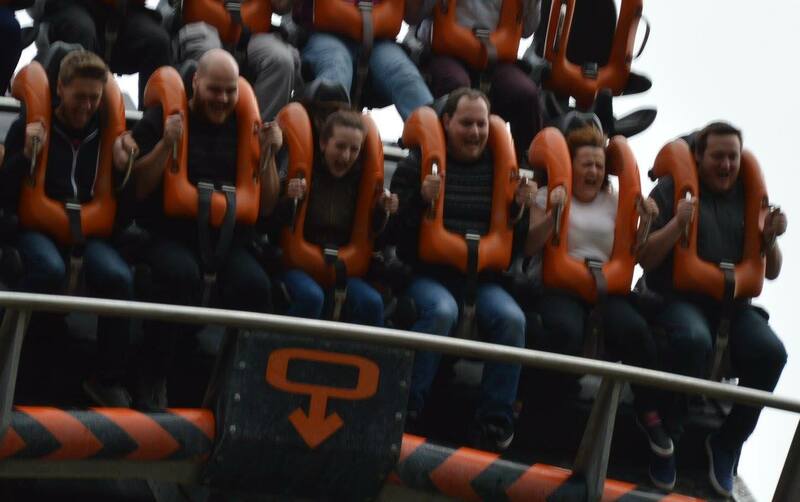 I was a bit worried I’d have lapsed back into being too scared to go on any of the big ones, but after a quick Saturday morning spin on Nemesis, I felt ready to face the rest of the park. Stuart, however, was quite nervous about it all as he hadn’t been to Alton Towers before, though his girlfriend Sam was already a bit of an adrenaline junkie (“Naw, just a junkie”, Stuart said affectionately). But once he got going, he enjoyed the rides a lot and wanted to do all of them (although he was still entertainingly sweary during the scary bits). It was Laura and Lori that really surprised me, though… they hadn’t even been going to come into the theme park at all until we discovered we could get them quite cheap tickets for the second day, as they weren’t sure it would be their thing. But they ended up going on quite a lot of the rides. They both did Th13teen and Rita, and Lori did Nemesis, Air and Sonic Spinball too. Opinion was divided on what was the scariest. 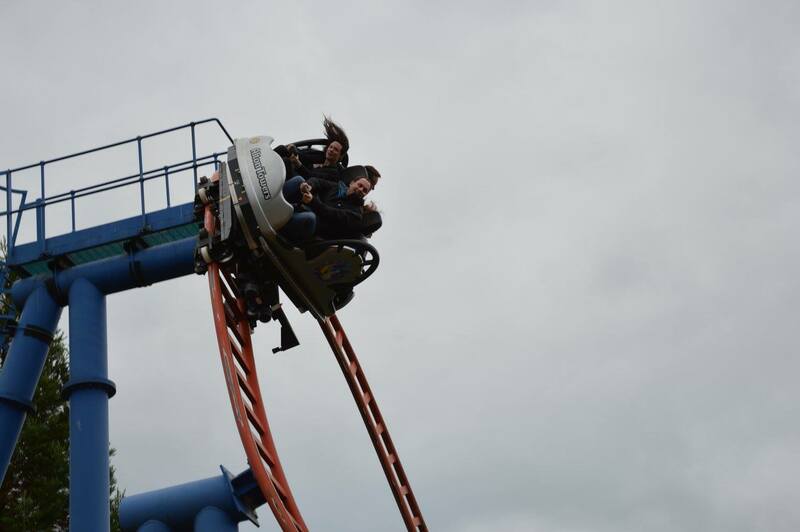 As I mentioned last time, Gavin, Alex, Heather and I are all terrified of Rita now, whereas the others just casually went on it and couldn’t understand what we were making such a fuss about. Laura said it didn’t bother her much, because she’d been in the car with her dad in his younger days. I did feel slightly vindicated when I read all the ride statistics online afterwards, though – at least in terms of raw G-force, Rita is the most intense, clocking up 4.7G compared to Oblivion’s 4.5 and Nemesis’s 4.0. Though I can fully understand why most people find Oblivion scarier – the fact that you’re experiencing 0.2G less than you would be on Rita isn’t really much comfort when you’re plunging face down into a huge dark hole from sixty feet up in the air. I know it’s blurred, but that gives you a better impression of what it actually looks like. It was a nice enough day on the Saturday for us to risk doing the water rides. I’m not sure if they were there last time, but there are now pay-per-use water guns lined up next to the Congo River Rapids, so you can pay a pound to soak ten innocent passing riders. We discovered this when a huge jet of cold water hit Stuart right in the face as we descended the rapids, but he made himself feel better later on by doing the same thing to some other unsuspecting people. And so the cycle continues. Alex and I managed to emerge from the rapids mostly dry, but both got absolutely drenched on the Flume. Note to self: don’t sit in the front next time. Or do what Gavin did and bring full waterproofs, including a plastic bag to keep his feet dry, though that seems a bit like cheating to me. Meeting one of my childhood heroes. As always, there was plenty else to do at the Towers as well as the white knuckle rides. Gavin and Stuart both became obsessed with those machines where you have to move the grabby claw so that it picks up a prize for you. There were lots of those all over the park, especially around the Arrr-cade in the pirate themed bit. (It’s not really called the Arrr-cade, but it definitely should be. Missed opportunity there, guys!). Gavin eventually did manage to win a Gremlin toy from one of them, though I dread to think how much it must have cost him altogether. I’m not sure if Stuart won anything from those, though he did win some soft toys for Sam from one of the “Win a prize every time” stalls. 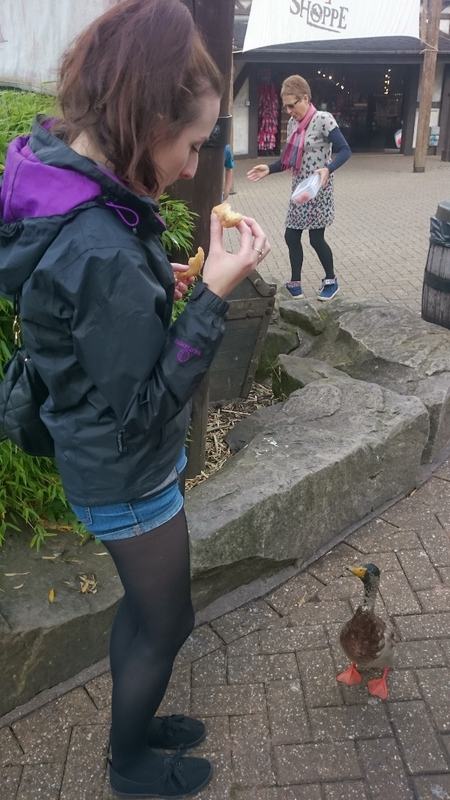 Heather, meanwhile, thought she was making friends with a duck near the Flume, but it turned out it just wanted to steal her doughnut. The doughnut thief eyes up his next victim. It was a great weekend… mustn’t leave it so long before going back next time 🙂 . (Photos mostly by Laura this time… I didn’t take my camera and hardly took any on my phone). So. Jeremy Corbyn is now leader of the Labour Party. I have some mixed feelings about this. On the one hand, it’s certainly nice that there’s finally a major UK party leader who has fairly similar political views to my own, something I don’t feel I’ve ever experienced before. But I have to admit I also worry in case all the warnings about him making Labour unelectable and leaving us with Tory governments for all eternity turn out to be correct. If that does happen, though, I do feel that the so-called “moderates” and Blairites in the party really have no-one to blame but themselves. If they’d actually behaved like the “moderates” they claim to be rather than like a very, very slightly milder version of the Tory party, maybe Corbyn wouldn’t have won a landslide. I don’t think there’s anything inherently wrong with being a moderate, being a realist, compromising where necessary, trying to appeal to a broader range of voters, and so on. Those things all have their place and are probably necessary to some extent in a party of government. But in my opinion, Labour has gone far beyond that over the last twenty years. I would consider myself a natural Labour voter, and if I’d been old enough to vote during the 70s and 80s I probably would have voted for them then. As it is, the first general election I was able to vote in was 2001… and I’ve never yet been able to bring myself to vote Labour. Trying to broaden the party’s appeal to people who weren’t traditionally Labour supporters, as Tony Blair did, was a sensible idea. But not if it meant abandoning the people who were already on your side… and as someone who considers myself a moderate left winger, I certainly did feel abandoned as New Labour introduced more and more policies that were in many cases actually further to the right than the preceeding Tory administrations. Tuition fees… privatisations… unnecessary wars… benefit sanctions… outsourcing of fitness-for-work tests to the monstrously incompetent ATOS… the Private Finance Initiative scam… I could go on, but you get the idea. At least in the early days of New Labour, they did some good stuff as well, like introducing the minimum wage, and devolution for Scotland and Wales. These days the whole right of the party seems to regard traditional left wing voters as a nuisance, as naive, backward-looking troublemakers who have to be scolded and lectured like naughty children until they see the error of their ways. And then they wonder why they lost 40 of their 41 Scottish seats to the SNP, and why the grassroots party members voted in huge numbers for a leader who’s about as far removed from New Labour as anyone in the party. Here’s an idea (although it’s too late to put it into practise this time round, I’m afraid): instead of constantly attacking Corbyn, why didn’t you, y’know, actually offer some sort of positive alternative that people might want to vote for instead? If Corbyn is really as big a disaster as you were all claiming, surely it wouldn’t have been difficult to explain why, and put forward someone who was clearly better? But instead of any sort of reasoned critique of Corbyn’s policies, we just got a load of vague terms of abuse… “unelectable”, “extremist”, “hard left”, “taking us back to the 1970s”, and so on. Most of the articles I read from senior Labour figures focussed almost exclusively on the unelectability aspect. Now, I can see that as an insider in the party, it’s obviously very important to you to get elected. But as a voter, I don’t just want you to get elected for the sake of it. I want you to get elected and then do something positive with that power. I’m not going to vote for you just because you might be a little bit less bad than the Tories. I want to know what you’re planning to do about rising levels of poverty and inequality, the increasingly unaffordable cost of housing, the creeping privatisation of the NHS, and other issues that are important to me. Then, if I like what you’re suggesting, I might vote for you. As for “extremist” and “hard left”… yes, maybe compared with the current political landscape in the UK, but if you step outside that narrow viewpoint and look to other similar countries, or back a couple of decades in the UK itself, Corbyn’s policies start to look quite moderate. Nationalise the railways? We had nationalised railways less than twenty years ago, and numerous European countries still do (and it’s worth mentioning that this one is very popular with the electorate as well). Free higher education? Scotland still has it, so do lots of other countries, so did the rest of the UK until relatively recently. A 50p top tax rate? We had that as recently as 2012, and it was significantly higher than that throughout most of Thatcher’s premiership. No nuclear weapons? The vast majority of countries don’t have them and it doesn’t seem to cause them any problems. The fact that policies like these are now apparently considered “extreme left” by senior figures in the Labour Party is something I find very alarming, and it makes me think we could do with someone who’s going to drag the centre ground back towards some kind of sanity before it moves any further off to the right. Alternatively, if they really think all of that is now “extreme” and “unworkable”, they’re going to have to explain why, because I’m not seeing it. I think what annoys me the most is when words like “modernisation” are tossed around, when it now seems to invariably mean things constantly getting more and more right wing. I’ve got no objection to parties updating their policies to be more relevant to the world as it is now. But I do object when “modernisation” always means more privatisations, more cuts to public services, more deregulation, and generally life getting more difficult for the majority as money gets siphoned up to the already-fabulously-rich minority. If that’s the sort of policies you really want to pursue, then fine. But, unless you’re going to actually explain why, stop pretending it’s somehow inevitable and even desirable. Stop pretending you still hold the principles of the Labour Party. And stop expecting people with left wing views to vote for you just because you’re wearing a red rosette. One last thing: if you think the SNP did so well just because of nationalism, think again. I’m about the least nationalistic person imaginable… I see national borders as a sort of necessary evil. I’d be quite happy living in an independent Scotland, a United Kingdom, or even a United States of Europe as long as it worked well for the people living there. I voted SNP because I liked the policies they were offering (like free higher education, free prescriptions, no NHS privatisation, strong environmental protections, strong infrastructure investment programme, attempting to protect people from the worst effects of the Tories’ welfare cuts). The sort of policies I’ve always hoped to see from Labour but have always been disappointed. While Scottish Labour seemed to do nothing but moan about how we can’t afford any of that, the SNP got on with actually making it work, and have mostly done a pretty good job in my opinion, even within the limits of Holyrood’s current powers. If you think more of the sort of negativity that basically lost you Scotland would have won you the next UK election, then fair enough. But I wouldn’t bet on it myself. I’ve seen a lot of people say “Oh, but Scotland’s very different from the rest of the UK, it’s much more left wing”. I’m not convinced. Historically it’s actually been fairly similar to the rest of the UK – if you look at past maps of election results, you’ll see a lot of blue in Scotland during the 1980s when the Tories were riding high, and similarly a lot of red during New Labour’s time in Government. It’s only relatively recently that the Scottish political landscape has started looking very different. Maybe the difference is not so much in the views people hold, but in the choices available to vote for.